As we understand Extrusion as Plastic Granules converting after Feeding into Barrel with help of Hopper Loader . Now here lets Understand the word Coating and Lamination . Normally there is specific grade of Low Density Polthylene (LDPE) or Polypropylene is feed in Barrel and heated which is melted and a “T” Die is used which forms in to a thin layer . Coating here is just a thin Layer is Placed on layer like woven sack , non-woven , paper etc and After that it is passed through a Cooling Roll which is just Attached the layer it passes through . A few Examples of Coating could Paper which is used in Food such Tea or Coffee cups , Juice Glasses is Coated with (LDPE) , another application would be Tarpaulin or the Best Term used is Raffia which is Coated with Polypropylene(PP) . Lamination is something two layers has to be Sandwich by thin hot layer of LDPE or PP , the best Application to understand is Rice Bag Which is Normally Laminated by Printed BOPP or PP . Lets further Understand the Classification as to what kind of Extrusions Coating Lamination Plant that could be supplied by Leena Extrusion . 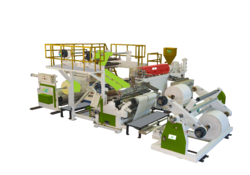 Our first is Basic Model with Single Extruder and Single Die with Turn Bar Attachment so that gives an Option for Lamination of Film on both Sides , however it also depends upon the Width of the Material , Second would be Single Extruder with Single Die but no Turn Bar Attachments this plants are mostly used for Paper and Tarpaulin Coating . Further to this we also have Tandem Lamination Machine which is with Multiple Extruder and Die here it gives as option for both side Lamination as well , We have developed Extrusion Coating Lamination for Rice Bags or Cement Bags for Lamination of Bopp Printed Rolls Both side with woven sack designed with Single Extruder and Double Die . Today Price is a major concern in every industry with growing demand in the plastic processing industry , which all requires that quality must be the best at cheaper rate in order to fulfill the requirement we have Designed a Co- Extrusion Lamination Plant which is designed with Double Extruder and Single die in order to Laminate Printed Polyester on Woven sack . We are a trustworthy organisation in offering a wide gamut of Extrusion Coating Lamination Machine. We are a trustworthy organisation in offering a wide gamut ofPaper Lamination Machine.